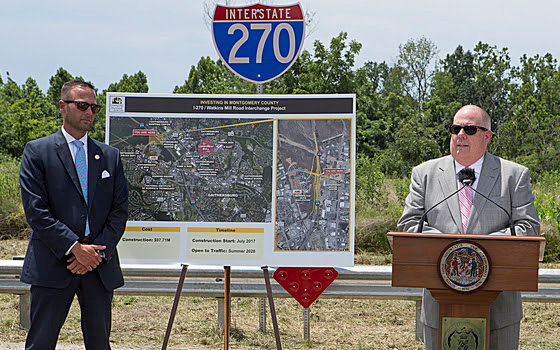 On July 11, Governor Larry Hogan announced the start of construction of the $97.71 million I-270 interchange project at Watkins Mill Road. This major congestion relief project will improve one of Maryland’s most heavily traveled roadways in Montgomery County, benefiting tens of thousands of travelers who drive the I-270 corridor. The 1.25-mile project extends between MD 124 (Montgomery Village Avenue) and the Great Seneca Creek crossing near Game Preserve Road in Gaithersburg.